Keep pace with consumer payment preferences. The future of the vending industry is cashless. It’s the key to future growth for your business. Learn how you can turn a cashless future into an opportunity for growth with industry-leading payment technology from Ingenico. No cash used to mean no sale. But not anymore. Cashless payment technology from Ingenico enables your business to secure those impulse sales, even when your customers are short on change. Convenience is key, which is why we’ve designed our vending payment solutions to comply with the latest contactless payment methods and NFC wallets, including Apple Pay, Google, PayPal and Alipay. After all, with consumers carrying less cash than ever before, cashless payment has never been more critical to your business growth. Handling cash is costly – from the time spent collecting and counting, to losses incurred through vandalism. But it doesn’t have to be this way. By switching to cashless payment, it’s not just your customers who benefit from increased convenience. It simplifies your logistics too, reducing the costs associated with cash management and giving you greater visibility of transactions across all points of sale. Cashless payment solutions open the opportunity for your business to vend higher value products placing a range of new markets within reach. And because the new wave vending opportunity covers everything from phones and tablets to pharmaceuticals, security is a key operational concern too. 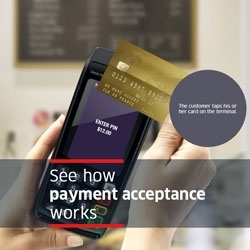 That’s why Ingenico’s cashless payment solutions are designed to meet current PCI PTS compliance standards, giving you confidence that payment will be collected quickly and securely. Easy integration: Our large selection of industry-approved devices makes it easy to find a solution that meets your business needs and integrates with your vending machine technology. 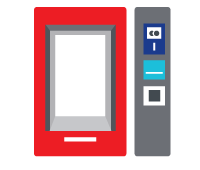 Fully flexible: iSelf Vending enables you to accept a range of payment methods, including contact and contactless credit/debit cards, meal vouchers and prepaid cards. So however your customer wants to pay, you won’t lose the sale. Stay secure: All iSelf Vending devices are designed to meet the highest security level, so you can be confident that they meet PCI PTS compliance requirements and will keep your customers’ data secure. Streamline operations: With Ingenico’s Terminal Estate Management solution you can oversee your complete iSelf terminal estate and carry out updates remotely, giving you control and convenience. Keep competitive: With cashless payment solutions from Ingenico you can adjust prices to the nearest penny, enabling you to keep competitive on pricing at all times. Find out more about how Ingenico can help you drive revenue growth through cashless vending systems. The implementation of contactless payment on our vending machines day after day proves to be an important driver of sales development […] The new refund by web solution offered by the Ingenico Group is perfectly in line with our omni-channel vision. It enables us to improve the satisfaction of our customers in all refund operations and simplifies the management of our fleets.